With Kaseto 0.9, metadata (like title and artist for example) as well as covers can be edited directly in Kaseto. The most requested feature ever, is a volume control to change the volume independently from the system volume. Now it is there! Furthermore, the selection of songs and albums works more intuitive now. 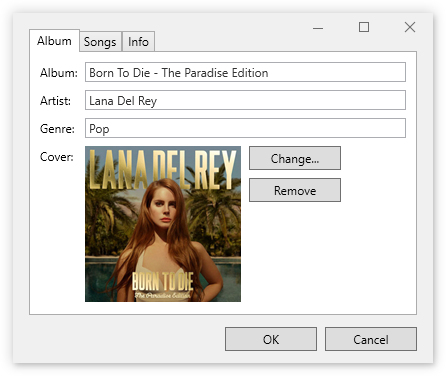 The metadata editor for songs and albums can be opened via a right mouse click. There missing metadata can be added or typos corrected for example. It is possible to edit titles, artists, genres, track numbers and covers. Several artists and genres can be separated by commas. The new volume control can be found in the header of Kaseto. According to the available space, the slider for changing the volume is located directly in the header or can be opened via a toggle button. The volume control works relative to the system volume. In Kaseto 0.8 and prior, the control key had to be held to select a song or an album. Now the selection works more intuitive and similar to Windows Explorer. A single click selects a song or album and a double click triggers playing. Clicking on the play icon starts playing immediately.